Tickets for ECCC went on sale today at noon and I had my finger on the buzzer. Hopefully I can score some sweet Swamp Things while I'm there. Is it time for East Cambria's Crocheting Convention already? And I'm just over the moon. Oh, my stars and garters! 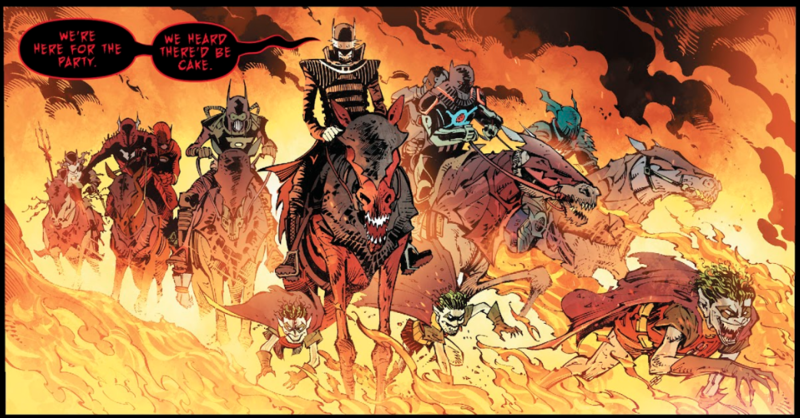 DC's METAL has been ridiculous/fantastic. And Detective Chimp just made an appearance! GodDAMN the Flintstones comic is killing it. Anyone read the first issue of Batman: White Knight? The premise is that the Joker is cured of his madness and he applies his genius to persuading Gotham that Batman was and is as great a menace as he ever was, and that only he (the Joker) can set things right. Resulting in Batman's incarceration. Quite liked the art and the premise, of what methods and behaviours we tolerate in the cause of justice, is compelling. Not entirely removed conceptually from the Cap the fascist story, but has the benefit of being some kind of alternate universe story (I think—I'm not a DC guy) and not drenched in Event crap. No, but interesting. I might have to give it a spin. WIthout his madness, what winds up being his actual beef with Batman? Despite being sane, does he still hold a grudge over being thwarted so frequently? That first issue has him arguing that the two have a marital relationship and that the Joker has held back the truth that Batman has always been a menace. He says that Batman isn't about justice but about social control, and the Joker's crimes were about enabling that need. Now that he is sane, he says that he'll repay Gotham for what he's done. He says he can be a better civic champion—i.e., a white knight—than either Batman or the police who also enabled him. Sounds like he's still crazy, to me. I'd like to think that is the larger takeaway as this plays out, that if the conventional distinction between Batman and the Joker is dubious, so is this revised distinction that has the Joker as somehow morally superior. Great feature on Tom King's Kite Man — King's Joker/Riddler arc did an amazing job with this meta/D-list punching bag. Say, I wonder what's brewing inside John Byrne's brain these days? Rep. Betty Price (GA) has lately come under fire for seeming to suggest that those infected with HIV and AIDS should be quarantined. She's now saying that her words were misunderstood, but whether or not that's the case, it raises an interesting and troubling question. Suppose HIV and AIDS, back when they first began to manifest, had been treated like any other contagious disease. Malaria, for instance, or typhus. Both of those killers were virtually wiped out by relentless containment. * What if the same thing had happened with HIV/AIDS? Unlikely, of course, since AIDS very quickly transformed into a civil rights issue, with people insisting their right to privacy was somehow more important than the right of others to, well, keep on living! There is an intensely cruel irony at the center of this. If those early suffers of HIV and AIDS had been quarantined, hundreds of thousands, even millions of lives might have been saved -- and most of those would be Gay lives. Isn't it fun to just suppose and stuff and complain about marginalized people who wish to be treated as human beings and not add on to their pariah status? Hopefully somebody can redeem Stilt Man one of these days.